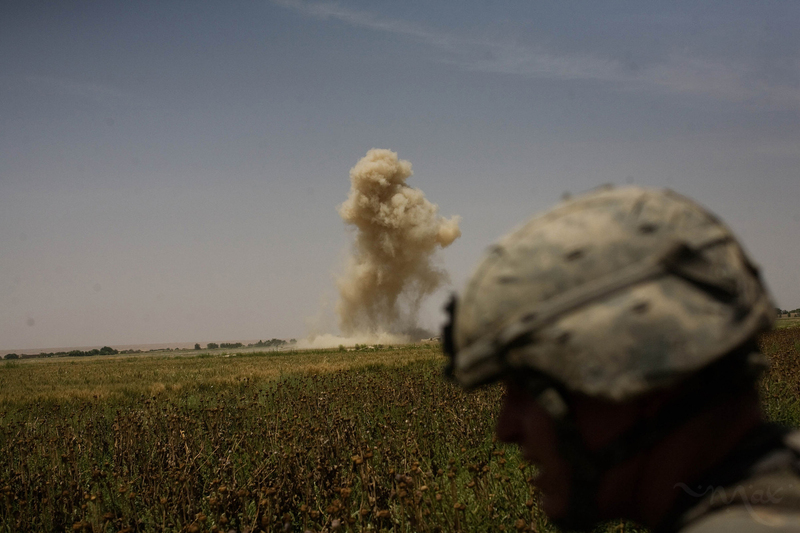 American soldiers watches as smokes rises from a rocket attack by American helicopters on a Taliban position. The patrol was harassed by a sniper and automatic weapons fire most of the morning. The 2nd Battalion, 1st Infantry Regiment, A Company operating out of Combat Outpost Lakhokhel in the Zhair district of Kandahar province searched several compounds and patrolled the village of Singesar and the surrounding area to talk to people and disrupt the Taliban operations closer to the main highway from Kandahar to Helmand province. Singesar is a Taliban stronghold and the traditional homeland of Taliban leader Mullah Omar.